What is the History of the True Church? The Church in apostolic days was filled with power! Today, Christians are spiritually lifeless. Why? What has happened that Christians seem cut off from the source of that power? News flashes constantly bombard us with reports of undreamed — of new powers unleashed by science. Never has the world had in its grasp more stupendous powers than it has today. Nations are stockpiling horrifying weapons of unbelievable power in a mad race for survival. Manufacturers are building machines with ever increasing power output to satisfy the power-hungry buying public. Health food addicts are peddling new powerful potions guaranteed to rejuvenate the impotent and the aged. Even the churches are selling people on new ways to tap "hidden powers" lying dormant within them. Yet people today are more spiritually empty, lifeless and lacking in power than ever before! The churches seem to be destitute of any real spiritual power! What has gone wrong? Are we missing the real source of power that imbued the original Church in apostolic days? There is a reason why people are spiritually empty, dissatisfied, frustrated. People have been seeking the wrong source of power! The churches are looking to material substitutes, to psychological panaceas. But they are not. looking to the real source of power which filled the apostles and the whole Church in apostolic days! Notice it! "Filled"! Filled with what? "With all joy and peace"! By what power? "By the power of the holy Spirit"! The inspired, original New Testament Church was filled with the power of the Holy Spirit. We don't see that today. Instead, we see either insipid pseudospirituality or uncontrolled human emotionalism masquerading as the power of God. Consider what mighty spiritual power overflowed the Church in apostolic days: "And when they [the inspired Church] had prayed, the place was shaken where they were assembled together; and they were all filled with the Holy Spirit; and they spake the word of God with boldness" (Acts 4:31). Inspired preaching — not soft, purring sermons — came from the apostles! Where do you see that kind of power in today's churches? This was not some kind of uncontrolled, pseudospiritual, humanly generated, emotional ecstasy often witnessed in evangelistic campaigns. This was the real power of God — not a counterfeit, uncontrolled emotionalism. But why are inspired, powerful; spiritual-minded sermons not generally heard today? Have the churches lost contact with the Holy Spirit of God? How many professing Christians really know what the Holy Spirit is — why they need it — and how they can receive it? And how many really know when they have received the Holy Spirit? How many really believe that God acts upon or operates in human lives through the Holy Spirit? Why do almost none of the churches and ministers agree about what the Holy Spirit is, or about why we need the Holy Spirit? Isn't it about time we understood the truth about this most vital subject? Most people are totally unaware of Paul's warning that there would be many false churches preaching different doctrines about the Holy Spirit — deceiving the many into accepting a different spirit from the one, true Holy Spirit revealed in Scripture. Notice: "But I fear" — Paul was sorrowed; he knew what was coming in our day — "lest somehow, as the serpent beguiled Eve in his craftiness, your thoughts should be corrupted from the simplicity and the purity that is toward the Christ" — Christ's doctrine is simple, when we understand it; it is not a theological mystery! Continuing with II Corinthians 11:3-4: "For if he that cometh" — any false minister coming in the name of Christ — "preacheth another Jesus" — the world is filled with, the preaching of a different Jesus who was born, who died and rose at a different time than the true Messiah, a different Jesus who rejected the Father's immutable laws — "whom we have not preached" — says Paul — "or if ye receive another spirit, which ye have not received" — from the preaching of the apostles — "ye might bear well with him" — or accept him. That is what has happened today! Paul warned about receiving a "different spirit" and "a different gospel." This prophetic warning from Paul has already been fulfilled! The world has accepted a different spirit — the spirit of error — not the spirit of truth. Professing Christianity is split asunder by hundreds of different denominations preaching different doctrines from those of the inspired apostles of Jesus Christ. It is time we face facts squarely and look into the Bible to see what God reveals about His Holy Spirit. There is only one Holy Spirit — only one Source of divine spiritual power. Without it we will never gain eternal life! Open your Bible to Luke 11:13. Here are Jesus' own words: "If ye then, being evil, know how to give good gifts unto your children: how much more shall your heavenly Father give the Holy Spirit to them that ask him?" "Spiritual qualities and entities seem so unreal to most people. And no wonder. Spiritual things are invisible, not discerned by the senses until revealed in writing in the Bible!" is it anything we earn. It is the source of spiritual Power we need, but which we receive as a gift upon asking God for it. But how do we know that God hears us when we ask Him in prayer? Here is the answer: "Whatsoever we ask, we receive of him, because we keep his commandments, and do. those things that are pleasing in his sight. And this is his commandment, That we should believe on the name of his Son Jesus Christ, and love one another, as he gave us commandment" (I John 3:22-23). Notice that we must not only repent and believe in Jesus Christ, but we must also obey the Father — that is what love is. "This is the love of God, that we keep his commandments" (I John 5:3). If we perform these conditions by surrendering our wills unconditionally to God, He will answer us. We can then receive His Holy Spirit. Observe how this is again explained in Acts 2:38: "Then Peter said unto them, Repent, and be baptized every one of you in the name of Jesus Christ for the remission of sins, and ye shall receive the gift of the Holy Spirit." That is how! YOU begin by repenting — by turning away from your past sins through the blood of Christ, by being baptized (immersed). YOU are then unconditionally promised the Holy Spirit. God has bound Himself to perform His part if you first perform yours. YOU can ask God thereafter to direct you through His Holy Spirit to lead a new life in conformity with His revealed Word, the Bible. To continue, in Acts 5:32 you read: "And we" — the apostles are speaking — " are witnesses of these things; and so is also the Holy Spirit whom God hath given to them that obey him." Notice the stress placed upon obedience, upon submission of your mind to the will of God — to the law of God. Jesus said, "Not my will, but thine, be done" (Luke 22:42). God expects a submissive, obedient attitude before we receive the Holy Spirit. How plain it is that the Holy Spirit is the spirit of total submission and obedience to the Father. This is the way to a full, abundant, Power-filled life! How many of you feel empty and frustrated; feel spiritually lifeless? Here's how to lead a rejuvenated, fruitful life — how to be imbued with Power! Notice the fruit of the Spirit: "The fruit of the Spirit is love, joy, peace, patience, kindness, goodness, faithfulness, gentleness, self-control; against such there is no law" (Gal. 5:22-23, RSV). It is by the fruits of the Spirit that you know you have received the Holy Spirit of God. "By their fruits ye shall know them," said Jesus (Matt. 7:20). The first fruit is love. Love is the greatest spiritual Power on earth. "The love of God is shed abroad in our hearts by the Holy Spirit which is given unto us," says Paul in Romans 5:5. What is the love of God? "Love is the fulfilling of the law" is Paul's answer in Romans 13:10. Love is a godly, spiritual force; imparted by the Holy Spirit, that channels the human will into obedience, obedience to God's law. If you love God, you will — by the power of God, not by your human strength — be keeping all His commandments — all ten of them. No one who continues to break God's law of love has received the Spirit of God or has the power of God working in him! That means that millions of deceived, but sincere, professing Christians who have not surrendered their wills to God and who do not keep all the Ten Commandments have never received the Spirit of God — they are still unconverted — and they never will be converted until they yield to God's spiritual law of love. The other fruits of the Spirit, mentioned by Paul in Galatians 5:22, amplify the attitude of love. Obedience to God is not harsh and cruel and unyielding — it is a joy, it is peaceable and gentle, it expresses itself in self-control. Self-control is the key to real spiritual power. Most people cannot be filled with spiritual power because they have not been willing to exercise self-control. Uncontrolled power is. worse than no power at all. I know that this is hard to believe. Some of you probably were taught that you cannot receive the Holy Spirit until you work up your emotions — until you reject God's law. That deceptive teaching results from hearing a different gospel than Jesus preached. That is the way of Cain who hated his brother Abel. God's law of love has been His message from the beginning (I John 3:11-12). But men have refused it! Man was born without the vital spark that will enable him to live forever. Man is mortal. Man is subject to death. Notice: "Now if any man have not the Spirit of Christ, he is none of his. And if Christ be in you" — living the same life in us now by the Holy Spirit as He lived by the Holy Spirit while He was personally on earth — "the body is dead because of sin; but the Spirit is life because of righteousness. But if the Spirit of him" — the Father — " that raised up Jesus from the dead dwell in you, he that raised up Christ from the dead shall also quicken your mortal bodies by his Spirit that dwelleth in you" (Rom. 8:9-11). How plain! The Holy Spirit imparts the power to commence eternal life. We inherited mortal life through Adam. We became heirs of eternal life — heirs of God — by being begotten through the Holy Spirit, which is the life of God. "And this is the record, that God hath given to us eternal life, and this life is in his Son" — not in an immortal soul. "He that hath the Son hath life; and he that hath not the Son of God hath not life. These things have I written unto you," says John, "that ye may know that ye have eternal life" (I John 5:11-13). Eternal life with unending spiritual power is a gift of God. It is an attribute of the Holy Spirit. "For the wages of sin is death; but the gift of God is eternal life" (Rom. 6:23). If we already had it, it would not be a gift; it would be inherited. But the Holy Spirit does more than impart to us the possibility of eternal life. It imparts to us the characteristics of the Almighty, the all-powerful God the Father. That portion of the Holy Spirit which a person may receive, if he asks God for it in conforming to His will, may be compared to the germ or sperm of physical life. It transmits to us God's spiritual characteristics and attributes. First, notice that the Holy Spirit — the germ by which we are begotten — comes from the Father. God has masculine characteristics. That is why we call Him "Father." We are called the begotten children of God (I John 5:1). God, then, has the power to beget us as His children. He begets us by His Spirit. Each portion of the Spirit by which we are begotten is termed in the Bible a germ or "seed." Peter tells us we are" [begotten] again, not of corruptible seed, but of incorruptible, by the word of God, which liveth and abideth" (I Pet. 1:23). Jesus completes this by saying we must finally be born again — at the resurrection — when we shall be spirit (John 3:5-8). Now we are only flesh with the spiritual germ of eternal life impregnating us. Second, notice that an attribute of God's Spirit is perfect character. The Holy Spirit, the germ of eternal life, transmits that possibility into us. It is the Spirit of obedience — of perfection. Every begotten child of God must ask God for the power to resist sin. We must let Christ live His life in us through the Holy Spirit. If Christ abides in us through the Holy Spirit, we have the power which enables us to resist practicing sin. Notice what Paul wrote: "... for what I would, that do I not; but what I hate, that do I. If then I do that which I would not, I consent unto the law that it is good.... For I know that in me (that is, in my flesh,) dwelleth no good thing: for to will is present with me; but how to perform that which is good I find not" (Rom. 7:15-18). Notice how weak and powerless to resist sin Paul really was. He needed divine help — the same power that was in Jesus Christ which enabled Him to resist sin. That power comes from the Holy Spirit of God! Conversion starts with repentance. Conversion means change. Repentance means a change from the wrong to the right. It is a change of mind. But that change is not enough. We must receive the Spirit of God in order for that change to be permanent. Our minds need to be developed to become like God's mind. "Let this mind be in you, which was also in Christ Jesus" (Phil. 2:5). But how is this possible? Your Bible reveals there is a spirit in man (Job 32:8). It is not the man — it is something in the man. Connected with physical brain, it forms human mind. It imparts the power of intellect and personality that no animal can have. This spirit in man is not conscious of itself. It cannot know apart from the brain. It is spirit essence. It is a human spirit. Man, with this spirit, knows only physical things. It requires the addition of another Spirit — God's Holy Spirit — to open the human mind to comprehension of spiritual things (I Cor.2:9-11). The mind of the flesh — with which you were born — is death — it produces death through sin; but the mind of the Spirit is life and peace (see Romans 8:6). Few grasp how great and all-powerful God is — and how great His kindness is in making it possible for us to have His mind! Now that we understand that the Holy Spirit imparts eternal life and spiritual characteristics of God, we can better understand the nature and attributes of the Spirit. Only when one is born of God at the resurrection does a person become perfect (I John 3:9). Christ is the only human being thus far born of God. He is perfect. If He, so to speak, lives His life in us by means of the Holy Spirit (that is the same as saying we are to live by every word of God, for Christ is the Word personified — Christ is the Bible in action), we have at hand the power of spiritual self-control as we yield to His Spirit. We have the capacity to grow toward a perfect character like God! Of course! If we are God's children, we are to grow up to become like Him. That is true of all offspring in nature — they inherit the characteristics of their parents. It is equally true of Spirit as it is of matter. Notice: "For the invisible things of him from the creation of the world are clearly seen, being understood by the things that are made, even his eternal power and Godhead" (Rom. 1:20). The physical creation reveals the divine attribute of God to reproduce us in His image. Nature reproduces therefore it reveals that God does. And if He is our Father, if we are begotten of His seed, the Holy Spirit, we shall become like Him. That is what the world does not know! Since there is a heavenly Father, and we are His begotten children, then God must be a family! And the Church of God must be composed of the begotten family of God. It is the Holy Spirit that unites the Church. Notice the family relationship in Galatians 4:6: "God hath sent forth the Spirit of his Son into your hearts, crying, Abba," meaning "Father." It is the same Spirit by which we are placed or immersed into the Church. "For by one Spirit are we all baptized into one body" — the Church (I Cor. 12:13). In Hebrews 12:9, the Almighty is called "the Father of spirits." We are ultimately, at the resurrection, to be composed of spirit — members of the divine family (John 3:6). "There is a reason why people are spiritually empty, dissatisfied. People have been seeking the wrong source of power! The churches are looking to material substitutes, to psychological panaceas." In the resurrection we will be changed to spiritual bodies (I Cor. 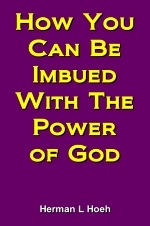 15:44) imbued with the power of God. Notice how often in Scripture we are declared to be heirs of the divine nature — of immortal, incorruptible, perfect, all-powerful spirit possessing the very mind of God. We are to be full "partakers of the divine nature" (II Pet. 1:4). But we may also receive a part of that power in this life — now! The apostolic Church had that power — so can we! Whenever we become members of God's begotten family, we receive a portion — a seed or germ — of the Father's Holy Spirit. "On the Gentiles also was poured out the gift of the Holy Spirit" (Acts 10:45). This gift is called a seed. It is poured out from the Father in heaven and, like physical life-giving germs or sperms, unites with the human spirit in each of our minds upon conversion. Each human mind is like the nucleus of an egg with which the Holy Spirit or seed unites. Just as the egg in a mother's womb must be nourished with life-giving food through the placenta, so we must be nourished by the Word of God. "The words that I speak unto you," said Jesus, "they are spirit, and they are life" (John 6:63). Those words are the Bible. That is why man must live by every word of God. Just as the physical life-giving nutriments circulate in the mother's uterus, so must the life of God circulate through our minds. We drink in the life-giving words of God from the Bible through reading and studying and meditating. Then, just as the physical poisons are carried through the umbilicus by the bloodstream away from a fetus in the womb, so must we allow our sins to pass from us by asking God for forgiveness through prayer, the shed blood of Christ figuratively bearing our sins away. But this is not all! Not only must the words of God flow into our minds through Bible study, but spirit must flow into our minds. Notice that each converted Christian receives a seed — composed of spirit, not matter — which unites with the human spirit in each repentant human mind. That is what begets us. But that spiritual germ must spiritually grow like the fetus in a mother's womb. Let "Christ be formed in you," said Paul in Galatians 4:19. And we are to "grow up into him in all things" — in spiritual mindedness (Eph 4:15). How is that seed, now united with our minds, going to grow? By the addition of more Spirit — by the "supply of the Spirit of Jesus Christ" (Phil. 1:19). Added to the germ which proceeds from the Father there must be a continual supply of Spirit sent from Jesus Christ so that our minds grow spiritually — till our minds become more and more spiritual — till we grow to mature spiritual minds. Spiritual growth comes through prayer — earnest, heartrending prayer! Most people don't grow spiritually because they do not pray in earnest! Just as a fetus in a mother's womb must have physical substance added to the original ovum (egg) and sperm if that new physical life is to develop, so we must be filled with spiritual nourishment — "filled with the Spirit" — so that our minds grow spiritually. The Holy Spirit from Christ and the Father may be" compared to a current of electricity flowing through a light bulb. We are that bulb. But there could be no light without a filament inside the bulb. That filament is comparable to the spiritual seed from the Father. As we receive more of God's Spirit, we emit more power — more light! Our light literally fills the room! The expression "filled with the Spirit" (Eph. 5:18) does not mean to be filled with emotional manifestations (which come from the flesh and not from Spirit). It means that we are imbued with Spirit from heaven administered through Jesus Christ in His office as High Priest. Notice how Paul explains this in Romans 8:9: "But ye are not in the flesh" — we are not motivated by fleshly passions — "but in the Spirit" — motivated and guided by Spirit — "if so be that the Spirit of God dwell in you." That is the Holy Spirit in the form of a seed from the Father transmitting His characteristics. But notice what Paul adds: "Now if any man have not the Spirit of Christ, he is none of his" — that is, the Holy Spirit from the Father and Jesus Christ, filling our minds so that we can grow spiritually. This begettal and growth through the Holy Spirit most people have never understood. In the Old Testament, men did not pray to the Father. But we pray to the Father. No one addressed God as Father in Old Testament times. Christ came to declare who the Father is — to declare that we may be begotten of Him: "God no one hath ever seen; an only begotten" Christ — " himself God, who is [ascended] unto the bosom of the Father, he hath declared him" (John 1:18, Panin translation). Then what about the prophets and patriarchs of old? Did they not have the same power as we can have today? Did they not have the same power as the apostles? How did they have access to the Spirit of God? Through the One who was to become Christ (I Pet. 1:11). Christ, one of the members of the God Kingdom, was the One who administered the Spirit to Moses, to Abel and to all the prophets of old. He sent the Holy Spirit of the Father to be in them, to give them faith and power. "And these all, having obtained a good report through faith, received not the promise: God having provided some better thing for us, that they without us should not be made perfect" (Heb. 11:39-40). It was not fully revealed to the patriarchs and prophets how one is begotten and born into the Kingdom of God. They knew only that through the Eternal, who would come to give His life a ransom for many, they would inherit eternal life. They knew that the Spirit of God was not then made available to the people in general. They knew there would be a "new and living way" (Heb. 10:20) whereby in the millennium all would have direct access to the Father through Christ — that the called might partake of the Spirit of God — "the earnest of our inheritance" (Eph. 1:14). Today we can have God's life and power as a very part of our being, enabling us to overcome and master our human nature! Spiritual qualities and entities seem so unreal to most people. And no wonder. Spiritual things are invisible, not discerned by the senses until revealed in writing in the Bible! When we speak of the Holy Spirit, many cannot grasp its nature. Yet the Bible makes clear the nature of spirit. Notice, "God is a Spirit" (John 4:24). The God family is composed of spirit. The Father and the Son, who are composed of spirit, have definite shape. From one end of the Bible to the other we are told about the shape and the parts of each member in the God family. The Father and the Son each have a head, hair, eyes, nose, mouth, arms, fingers, a torso, legs, feet, plus inward parts. Man is in the image of God. Man is matter, but God is spirit. The Holy Spirit, like matter, exists in various states. It not only composes the members of the God family, it also flows through our minds and empowers us to do good works. Even though the Father and the Son are in definite locations with respect to each other, spirit proceeds from them and fills the entire universe, much like air fills everything on earth! Note David's words that God's Spirit permeates everything (Ps. 139:7-11). Spirit is God's life. Air contains the physical life-giving oxygen of man. Notice how similar the comparison is. The divine Spirit that fills the entire universe is the channel by which the Father and the Son create. The Spirit of God transformed the creative energy of Father and Son into the physical world we see around us. Man has no such attribute or power born into him. But man may form tools which transform man's expended physical energy into visible objects, into light, heat, and numerous other physical manifestations. Man is put here on earth to learn to develop tools for limited creative work — to train himself for the eternal goal — becoming part of the God family, which means sharing control of the creative Spirit of God. (Read our free booklets Why Were You Born? ; What Will You Be Doing In The Next Life? ; and Just What Do You Mean... Kingdom Of God? God is a family. The Father in heaven wants you to become a member of His divine family. You can be His son if you surrender your whole life to Him; believe all that is in the Bible; believe Christ is your Savior and obey Him; and become filled with the power of the Spirit of God. This knowledge has now reached you. What are you going to do about it?